My favorite thing about this book was that the main character, Jo, was a paparazzo. I just thought that was so cool and pretty original. I don't think I've read any YA where our main gal has that as her profession. I wonder what kind of research Allison Rushby had to do, so she could get all of her inside information. Jo was an awesome character. She's straight forward, doesn't take crap from anyone, and is all about the job. Until she has to go undercover and get some highly coveted shots of superstar, Ned Harnett, while he's recovering at a "retreat". It turns out being a paparazzo has only been so easy, because she never got to know the people she was snapping pics of. While at the retreat, she really has no choice but to get to know the other people there, including Ned. It doesn't take long for Jo to realize that he's a real person and what she's doing could have real reprecussions. Ned was the anti-celebrity, celebrity. He didn't behave like your normal famous teenager. He was a nice guy who cared about the other people at the retreat, wasn't prone to tantrums and demands, and definitely had some stuff going on inside. The friendship and eventual romance that develops, between Ned and Jo, was very sweet. They are both hiding things, but ultimately realize they need each other to get what they really want. I like the turn the story took around the last third of the book, I don't want to spoil it, but it was a fun twist and definitely made for some great situations. This was a cute, quick and fun read. Definitely recommended for contemporary fans and even those who don't always choose contemps. 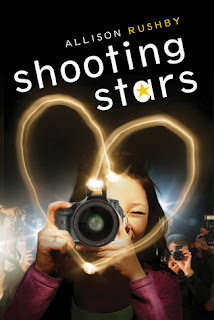 The paparazzi angle was fun and fresh, and the whole book was filled with great characters and a good story.